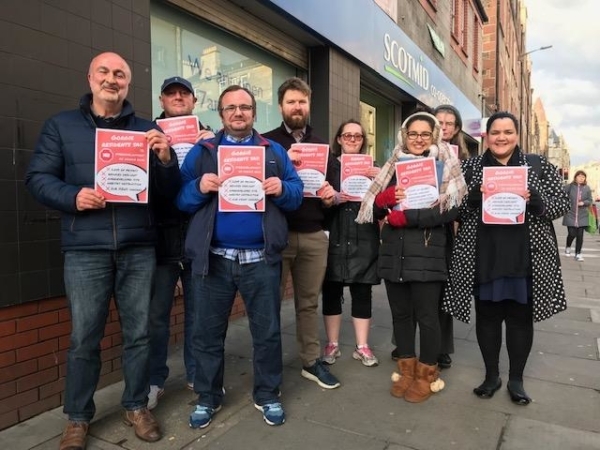 Local Residents in Gorgie today launched a campaign to oppose a proposed 6-storey student development on the site of the current Scotmid store at 236 Gorgie Road. An earlier version of the proposal was refused after attracting 52 objections and not a single letter of support from local residents. It was previously reported that Scotmid was accused of ‘dirty tricks’ by local residents after attempting to influence the planning process by encouraging their own staff to register supportive comments about the development. Gorgie residents attending the Gorgie-Dalry Community Council earlier this week called on the Community Council to object to the proposal. There are currently 85 objections to the development registered with the Council. Members of the public are able to comment on the proposals on Edinburgh Council’s Planning Portal until 8th April 2019. This is so strange. Oh and let’s leave the students out of this for a moment. They are innocent pawns in this game of property Chess. I inherited a flat in Morrison St, less than half a mile from this proposed development. Point the finger, point but heyho I sold it for under 12K. Students to attend what place of learning exactly? Napier University which grows proudly in stature year by year, but sits uncomfortably in the denizens of Merchiston and Morningside, would seem the obvious. Edinburgh University would never house its high paying Chinese or Indian guests in Dalry. Too many ruffians. So the areas that are still inhabited by Alistair Darling and until recently JK Rowling must keep their tranquility and the issue can be settled mostly within Council Band C.
A congested choke point area. I mean it. Sometimes Dalry road resembles Bangkok without the street food or the weather. The residents deserve better and for that matter so do the students who will be parked literally miles from their place of learning. A lot of money is in play here, take a deep breath, you’ll smell it.